Discover what makes B2B purchasers more likely to engage with new insights from a LinkedIn study, and find out what it means for your sales prospecting strategy. This is it – out of all the stats you will see this year, this is the one that will redefine what it means to be a social selling professional. LinkedIn surveyed 1,500 B2B purchasers/influencers who were in Director+ positions on the network. In the survey, B2B buyers said they are more likely to engage with sales representatives who possess thought leadership, reach out through personal connections, and share industry knowledge. So, how can you increase your appeal to B2B buyers on LinkedIn? In our survey, 92% of B2B buyers will engage with a sales representative who is a known industry thought leader. But what does it mean to be a thought leader? It takes time to become an influential figure in an industry. You need to build trust among industry insiders and provide unique insights regarding relevant topics. Be visible. Your LinkedIn profile should be complete, include relevant keywords for searches, and contain several points of contact. Your profile is an opportunity to express yourself as an individual, so offer an authentic, human face to your company. Be forward-thinking. Pick a topic and make yourself a go-to resource by curating, creating and sharing relevant content. Make sure to provide your unique insight and where you think future opportunities exist so that you are providing insight not readily available elsewhere. Be a curator. LinkedIn’s Daniel Tunkelang notes that thought leaders take “advantage of access to a community of experts to distill the highest-value knowledge from that community and propagate it to a broader audience.” Seek out content to curate on your company and personal pages. 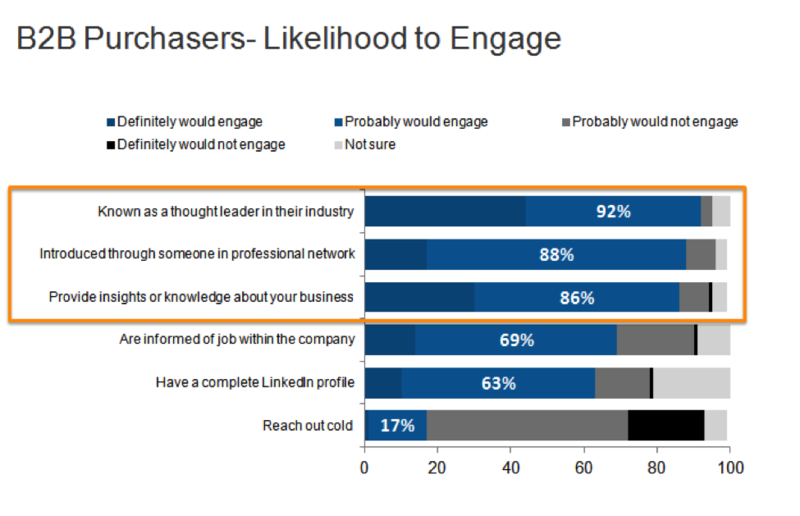 Our survey also found that 88% of B2B buyers engage with someone in their existing professional network. This places greater importance on building that network before engaging with buyers. Without a robust professional network to leverage, sales reps have fewer chances for a warm introduction. 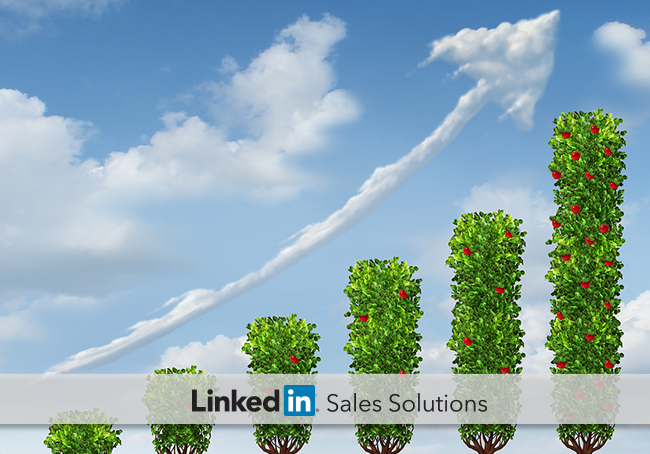 Cold calling may be dead, but that doesn’t mean cold social selling is a better alternative. The survey also found that just 17% of buyers engage with reps who reach out cold. It’s the cold aspect itself that turns off buyers – if they don’t recognize you, they are less likely to engage. Be aware. Save potential leads who have already viewed your profile. Each saved lead is another opportunity to establish a healthy sales relationship at the right time and with the right form of outreach. Be a team player. Your coworkers might have connections that are aligned with your prospect interests. Use them! The TeamLink function in the new Sales Navigator allows for warm introductions between team members and prospects. Finally, our survey found that 86% of B2B buyers engage if sales professionals provide insights about their business. Insightful sales reps share unique perspectives on industry issues and provide customer value before promoting their product or service. Be a publisher. Use LinkedIn’s publishing platform to post content on your professional profile. Tackle common prospect questions and link to your content within Group discussions. Be validated. Get on the radar of a LinkedIn Influencer, and eventually they might help promote your content. But first, solidify the relationship by attending their LinkedIn Groups and asking insightful questions, writing testimonials for their product/services, and commenting on their content. The numbers don’t lie – B2B buyers are more likely to engage when you are influential, connected, and insightful on LinkedIn. Check out our latest eBook "The New Formula for Connecting with B2B Buyers" to see how to use LinkedIn’s social tools and tactics for stronger sales.